When it comes to your dining room, be brave and throw caution to the wind. Choose the design road less traveled, and forgo the matchy-matchy dining sets that are sold at every furniture retailer. Instead, opt to surround your table with a unique and eclectic blend of chairs in different styles, colors, materials, and finishes. Here are 12 ways to work this casually chic mismatched seating trend into your dreamy digs. Now that's what we call being a rebel! This bohemian setup is the definition of sitting pretty. From warm wood finishes to an assortment of textures, this space is all kinds of cozy. But to be perfectly honest Witness Apartment, you had us at the Marcel Breuer Cesca Chair. 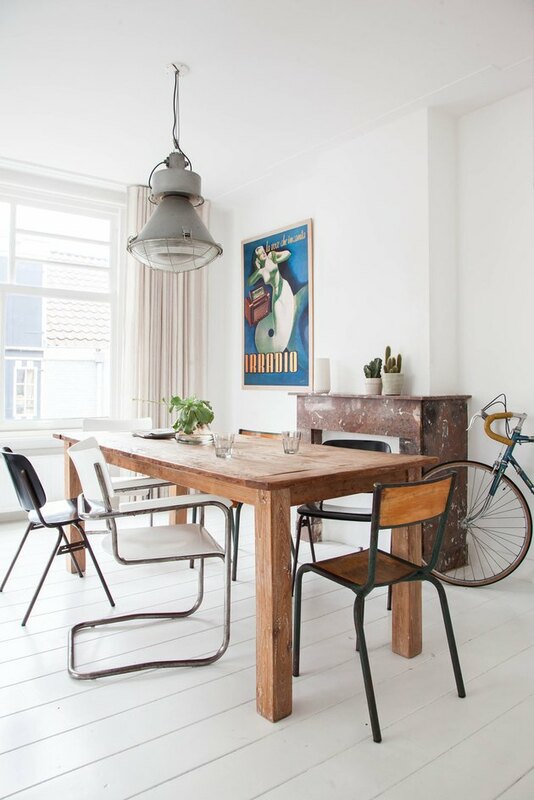 Give your lofty dining room a gritty and urban makeover by pairing a rustic table with a collection of vintage metal-frame chairs. If you could have dinner with one of the design greats, who would it be? Eames? Thonet? 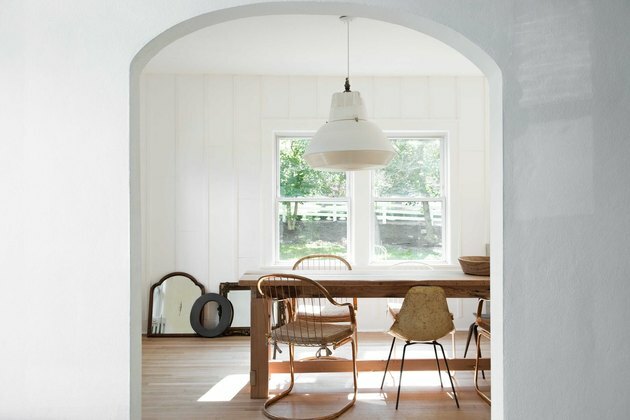 What the heck ... follow the lead of this Swedish country cottage and invite them all. A rustic table — made with wood floor planks from the 1700s — is surrounded by iconic classics. Now that's what we call dining by design. 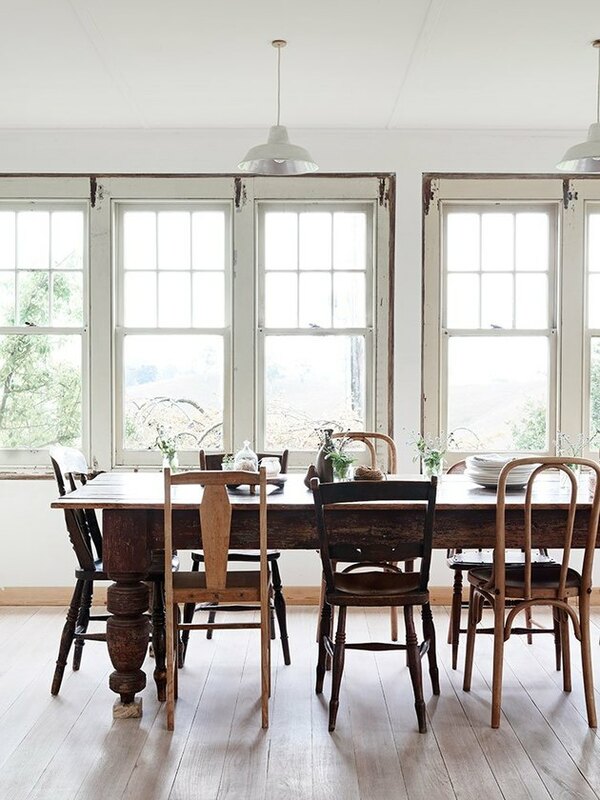 With a rustic dining table that is over a century old, and a stunning array of wood-frame chairs, this farmhouse-style space makes us want to pack up and move to the countryside to run our very own quaint little eating house. We're just swooning over Melodie Michelberger's modern dining room mash-up featuring a bench and metal and wood frame chairs. 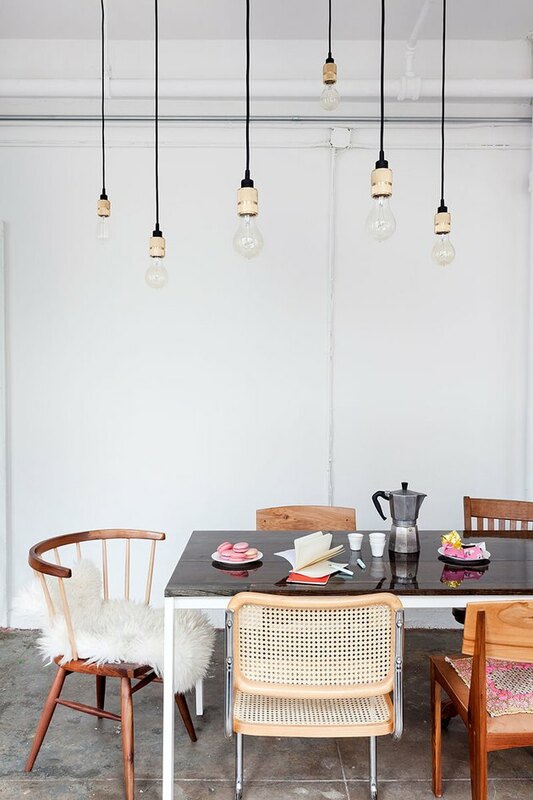 And just when we thought it couldn't get any better, this effortlessly chic dinette is beautifully illuminated thanks to a vintage industrial pendant by Louis Poulsen. Interior designer Leanne Ford really outdid herself with this striking minimalist dining room. 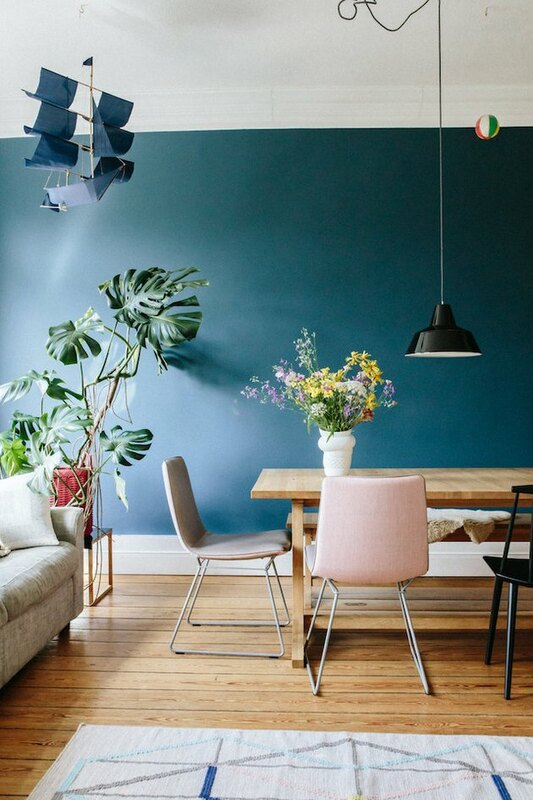 All we can say is, if mismatched chairs are wrong, then we don't want to be right. 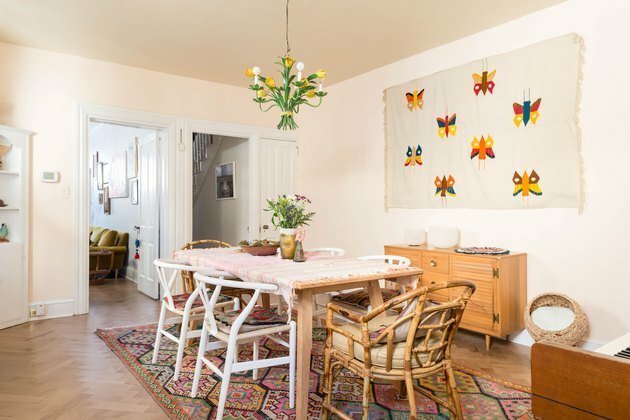 If you're having trouble letting go of your grandmother's seriously outdated decor rule — that all of your dining chairs have to look the same — don't worry: You can take baby steps into this new and exciting world. 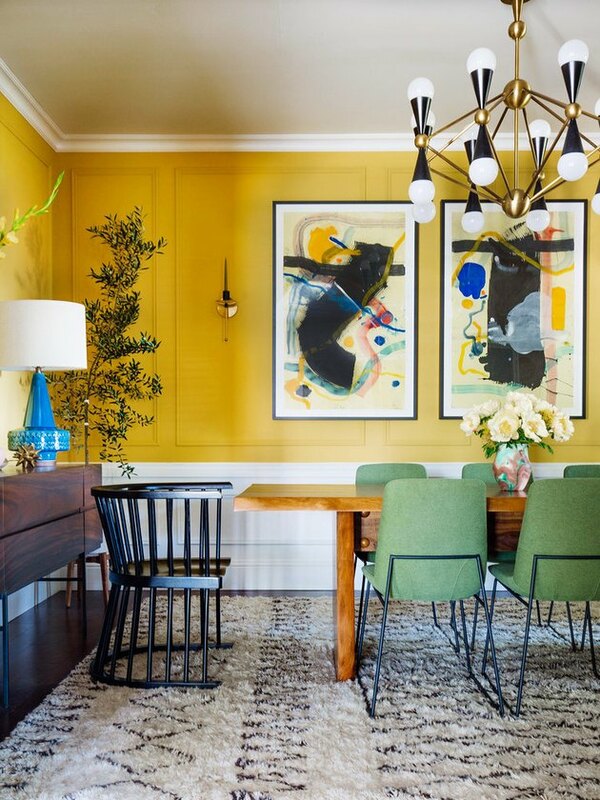 All of the chairs in this bright, midcentury-inspired dining room by Dabito from Old Brand New are the same except for the sculptural black Bolah Chairs at either end of the table. Krista Freibaum, the co-owner of Serious Business PR and self-described "psychedelic grandma", had the same idea as Dabito. 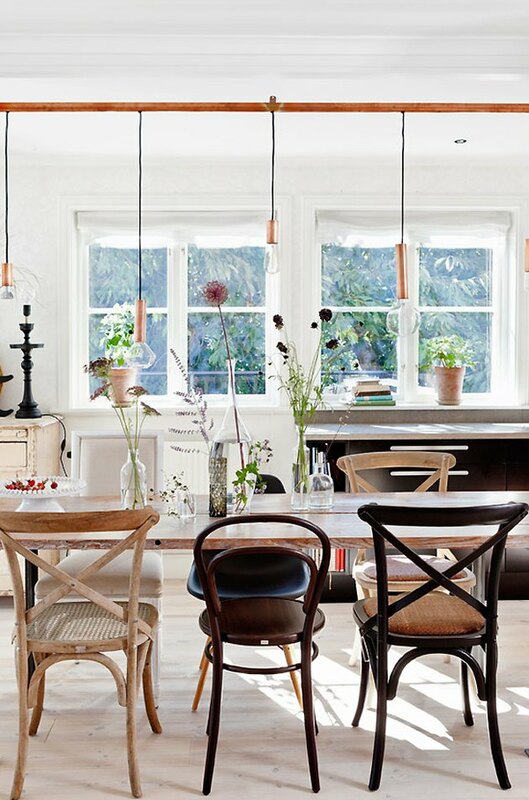 She paired white Hans Wegner Wishbone chairs with rattan armchairs at either end of her rustic dining table that was crafted by Jonathan Bancroft. 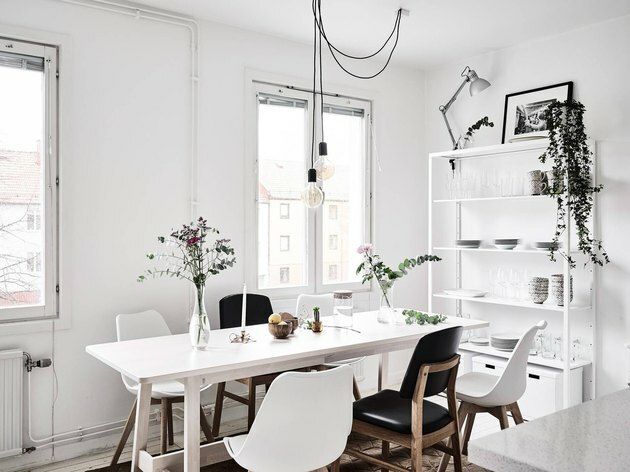 Obviously the design gods are smiling down on this chic Scandinavian dining room. A tale of timeless elegance, this black and white color story sets the scene for dinner party perfection. If you're having trouble jumping on the mix and match train, this option might be the perfect compromise. Pick a color, any color, and get to work painting your various flea market finds. 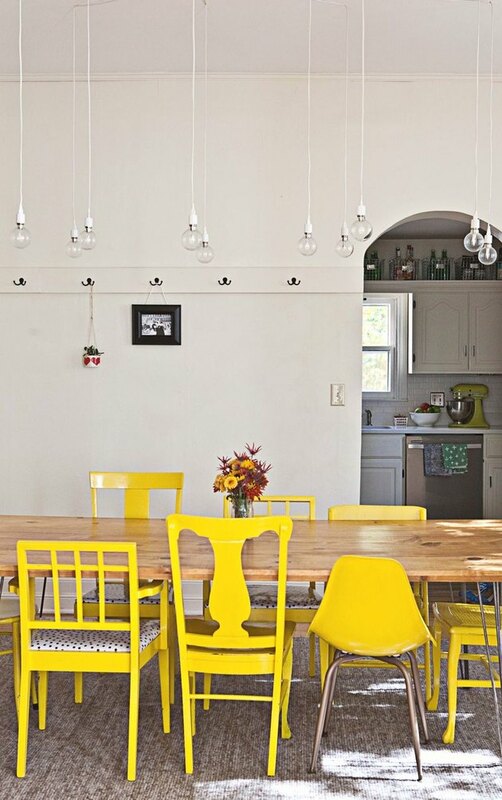 Elsie from A Beautiful Mess gave her dining room a cheerful and bright yellow makeover. 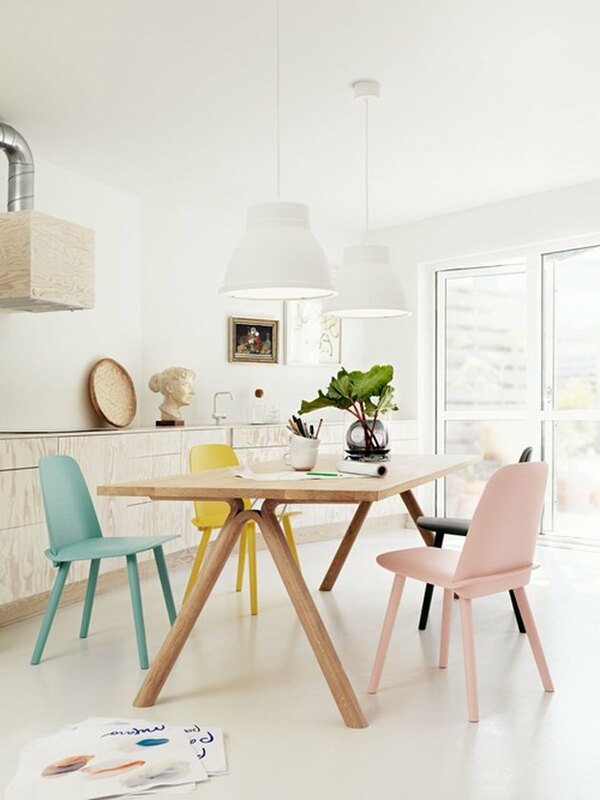 Or, just buy the same chair in different colors like these pretty pastel numbers from Muuto. 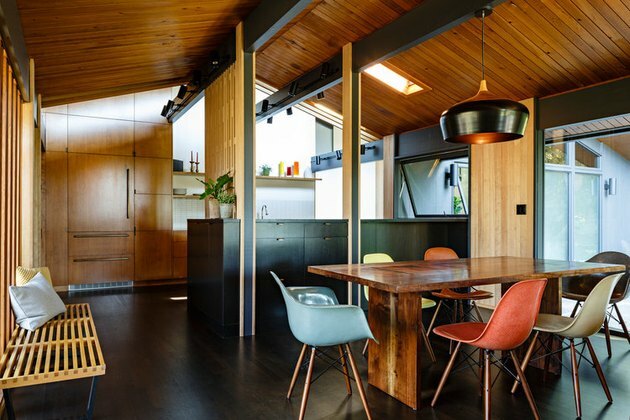 This 1950s Portland abode is living the Eames dream. Paying homage to the era and its midcentury roots, this dining room is filled with Eames Shell chairs in a variety of fun colors.